These villas were built in the early years of the 20th century and this photograph was taken around the time of the First World War. The street scene has changed relatively little, although some of the front walls and railings have been removed to facilitate parking. The house on the right is 35 Loughborough Road, followed by 37, 39, 41 (double fronted), 43 & 45 (the ones with no bay on the first floor), 47 (double fronted, two gables), 49, 51 (one gable). The photograph is taken looking from Quorn. Barrow Road is further to the right between 31 and 29. 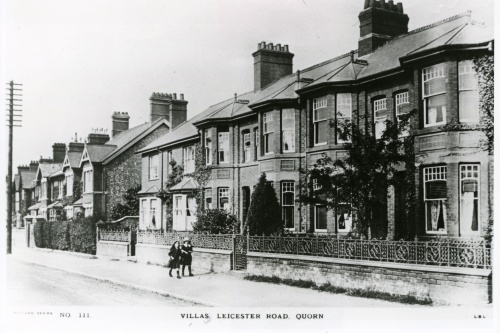 Although the postcard is titled 'Leicester Road', it is actually Loughborough Road.